I went for a run today. It was neither far nor fast. It was my best run in months. Nope, it was more the description of the joy and spontaneity of getting on the trails – what seemed like a spur of the moment decision by the author to just follow a different path. It reminded me that I hadn’t been out in the hills for what seemed like an age. So contemplating the evening sunshine, I got ready and just ran for the love of it – no phones, no music, no zombies, no empire-building – to be honest if it hadn’t been for the fact that I had some outrageously-hot jerk chicken cooking in the oven, I would have left the watch at home and just carried on until the sun set. The result was less than 4km in something like 25 minutes – I didn’t really check – an one immensely happy runner. I ran most of it, I walked in places, I even stopped to admire the views WITHOUT PAUSING MY GARMIN, I loved it. I often find this happens with trail running. Something about being in the countryside; the fact that within a couple of hundred metres of stepping off the road you can be in the middle of nowhere; the mud, nettles and brambles – I’m not sure what it is. I think there is also an element of sheer joy in trail running that, personally, I can’t find in road running. Offroad, I have to concentrate completely on each step, on where and how my foot is going to land on each stride, on how I’m breathing. That brings with it a lovely feeling of leaving other thoughts behind, of a complete f*£k-it-all-to-b^ggery need to just think about what you’re doing, nothing else. And how rare is it that we get that luxury? Even on a road run I find I spend the time organising my thoughts, planning my day, sometimes going as far as drafting emails in my head. Beyond that, this run also made me realise I have something of a duty to be out on those trails more often. Having previously made this route one of my regular runs, I haven’t been along these paths for some time, and some of them have become pretty overgrown. If people like me aren’t out there using the paths and keeping them visible, they could easily disappear completely. I’m sure all of us trail runners have been in the situation where we have seen where we know there should be a path across a field, but it just isn’t clear enough to be sure. Having previously treated my running as a pretty solitary existence, I have now finally joined my local running group – and I can’t believe I haven’t done it before! A mere four years since I first went along to a club outing, for the past four weeks I have joined the more advanced of the groups with the aim of pushing myself further and progressing with my running. After my first attempt to join the club a few years ago, I decided it was too difficult to try to get home from work in time to make the run each week, and then the arrival of Ethan curtailed most early evening activity. Now however, with Ethan in a great routine and happy to see the back of me for a couple of hours, and after a year or so of working from home, this was a perfect time to start properly with Greenfield Greyhounds. I have always been happy to promote the idea of a running club, but not always convinced it was right for me. Having spent a good few years as a disciple of British Military Fitness, I am happy to bang the drum for the benefits of collective exercise and training. Team spirit, friendly competition and the support of your mates are all great motivators, and are sure to push you on further than you might achieve on your own. It’s just that I have always preferred running on my own – possibly because I view it equally as a chance to have some time to myself. I guess there is also an element that I love planning my own routes for running, sometimes just heading out with only a vague idea of where I’ll be running. So why change it? I have recently found it difficult to keep my motivation sometimes – I’ll have a couple of weeks of great running and then will easily find an excuse to miss a couple of runs, or leave it a week or more between outings. The thought of committing to at least one good length run a week is a great motivator. In addition to that, having this one decent run in place each week means that I’m more likely to keep up my other runs during the week in order to keep improving and perform better during club runs. The group itself is great – not too serious that there is any serious competition or any frowning if anyone walks up the steeper hills or misses a week. But serious enough that I’m pushed along on every run, and always come home properly knackered. There’s a great variety of running too, even in the four weeks I have been going along – two off-road and two road routes, all of which have had paths on which I have never run before. More important has been the effect club running has had on my motivation – Tuesdays are now planned in my head around the club run in the evening. From deciding what to eat and making sure our evening meal is a little earlier than usual to allow me time to digest it, to pre-hydrating during the day in preparation for a tough run – all of this builds the anticipation and enthusiasm for the run ahead. Of course, the hope is that the benefits of joining the club will become manifest in the coming weeks and months – but even if they don’t, I’ve found a great way to stay motivated and hungry! So after a couple of weeks of illness, procrastination and a couple of other issues, I finally got back out on the roads this evening and posted a 5k in just over 25 minutes. So far, so dull – but why such a quick time after a slobby layoff and in hot, windy conditions? Of course there could be so many different reasons, and self-analysis is one of the worst traits of the regular runner. Was it the meal I had? The time I ate? Hydration? Attitude? Feng shui? One thing I did change for this run was a revisiting of some of my older running shoes which I had previously given up as not really right for me – Inov-8 Road-x 255. When I bought them a couple of years ago, I was just transitioning away from heel striking and thought these would be perfect. In hindsight, I probably wasn’t ready for them – I ended up with sore feet which went slightly numb on longer runs. Why the change? Well, my brand spanking new Adidas Refine Element Tricot have been causing me a bit of frustration. Having the upper made entirely from knitted material does make them feel snug and comfy, but comes with its own issues. Without any kind of toe protection or reinforcement if there is even so much as the smallest drop of sparrow sweat within a hundred metres of them, your foot will be wet. And as I run on lots of hills, they are already showing alarming signs of wear around the big toe area as a result of downhill running. Not good. Chucking on the Inov-8s felt great – they feel low and quick, and I love the fact there is so much room around the toes. While these have more heel-to-toe drop than I am used to, on this run at least that extra bit of material under my heel served only to remind me to get up on my toes rather than slouch back into heel striking. And after tonight’s run there were no signs of pain or numbness. Definitely back in the mix for my next road run, especially if they were the reason for the speedy strides. 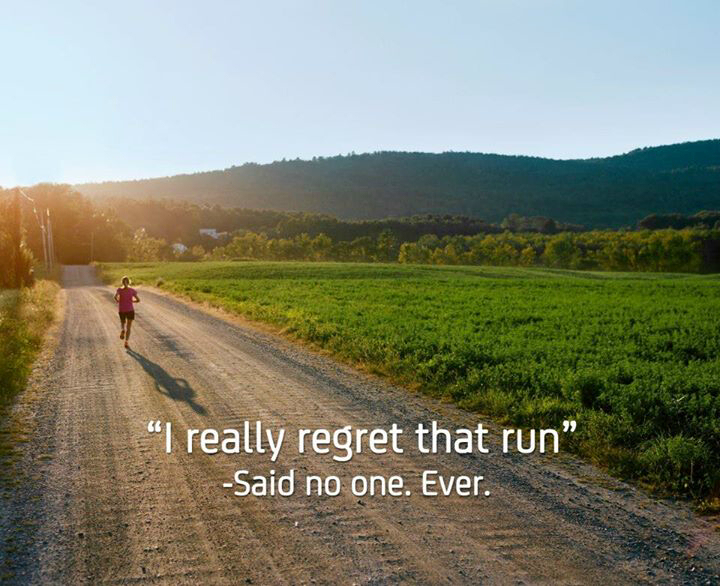 Or it could have been something else completely – the fact that I haven’t run for nearly 2 weeks and was absolutely dying to get out there is probably a contributory factor. Whatever the reason, I’ve no doubt I’ll continue to over-examine every part of every run. Surely I’m not the only one…? …well, a foot to be honest. I may have finally gone completely mad, I have just bought a pair of football trainers as my new trail running shoes. Now, if you have quite finished sniggering at the back, I’ll explain my thinking. I try to run the majority of the time off-road, especially during the summer months. This is partly because my knackered ankle joints prefer a softer surface to run on when they can find it, and partly because my mind prefers to get away from the noise and traffic of the roads. The result is that I have bought and run through more trail shoes than road shoes since I have been running ‘properly’. Some trail shoes have been brilliant, some mediocre. Some have cost £20 from Decathlon, some have been more than price of a meal and a good night out for Christina and I. In the end, no single pair has ever lasted more than a summer and a winter – either through sole wear, coming apart or, in one case, just not being up to the job. The one thing I have learned through all of the trail runners that have come and gone is what works for me. The aforementioned ruined joints need be kept close to the ground if possible, so any shoe with large amounts of cushioning is out. I’ve managed to transition to forefoot running, so a flat shoe fits the bill. I find the notion of waterproof trail shoes highly ridiculous, so no need for Gore-Tex or anything similar. So I’m after a fairly minimalist shoe, lightweight, high on grip, low on anything unnecessary. Why does it have to be a designated ‘running’ shoe? I’ve been struggling to find anything to suit that isn’t crazy expensive. I would love to buy a selection of Vivobarefoot for every day of the week – which are the closest I have found to my off-road running heaven. Football Astroturf trainers have pretty much all of the features I’m looking for. Close to the ground, minimal cushioning, lightweight materials and grip that is designed not only to hold the surface but also to turn and accelerate. ‘But they aren’t designed for running.’ A fair point, but not necessarily true. A decent professional midfielder will easily cover more than 10km over the course of a match. So, an experiment. The shop had these in the chuckout section, in the right size, and the more I thought about it, the more it made sense to give them a go. Ah, finally… After what has felt like a long winter, and one which had a particularly cold sting in its tail, it feels like we are heading into a proper Spring. Alongside the growth, renewal and optimism the new season inevitably brings, Spring allows the early morning runner to ditch the high-vis gear, head-torches and reflective strips that have been a constant companion since Autumn. For me personally, today’s early morning run was the first time that I felt there was enough light at 5:45am to leave the roads and pavements behind and head out onto the trails for an off-road run. Due to a combination of work and childcare, early morning is currently the best time for me to get out running without causing major upheaval, and through the winter, this tends to limit my options somewhat. Before this year, when I finally purchased a head-torch, I stuck to well-lit roads and pathways. Even then, the early morning runner tends to be saddled with the coldest part of the day which needs that extra degree of motivation in order to get out of bed and lace up the running shoes. No such problems this morning. A beautiful, sunny day yesterday preceded by a few rain-free days this week meant I was confident the trails would at least be navigable, and I was excited to get back to one of my staple routes from last summer. A quick 1km on a quiet road to warm up saw me at the start of the trail, heading steeply uphill to traverse the side of the fell. This first part of the route is also the wildest, crossing grazing for a sheep farm with gradients steeper than 25% in numerous places. From the fields full of mutant sheep (seriously, you need to see the size of these things…), the route heads across Saddleworth Golf Club and one more field full of sheep to another section of road. The growing light of the morning had seen a corresponding rise in the volume of the dawn chorus, while crossing their territory had prompted a couple of yawn-y stares from the sheep. However, in the final sheep field my arrival, panting and cursing under my breath over the stile in the wall, caused two wild deer across by the opposite wall to take flight. Too fast for me to get a good look, I think it was a mother and a young fawn – all I can say is that they were still sprinting a good quarter of a mile away. The second half of this route drops down a rocky footpath, and following a final road section, climbs steeply across a couple more fields. Being only my fifth run back into regular mileage after an injury and laziness affected start to the year, there was quite a bit of slowing and walking up the steepest parts of the hills, and the resultant 1hr 5mins for the 10km shows my fitness levels are still on the way back. However, the arrival of Spring at the same time as my running mojo has reappeared augurs well for the next few months. Running off-road is my natural preference – the variation, hills and challenge appeal to me more than pounding the roads. Now the mornings are lighter, I’m looking forward to many more trail adventures to come. Success and progress. I tend to claim the smallest improvement in performance as a huge win and berate myself for missing out on a mental milestone by a couple of seconds. I think most runners are similar – our chosen hobby leans towards judging oneself by seconds and fractions of distance, while for most of the time our only competitors are ourselves and our goals. It’s also easy to overlook longer-term progress. I’m now run-commuting 9 miles at least once a week, in addition to BMF and other running, so loads more miles in the bank compared to a few months ago. With a flash, summer seems to have arrived – meaning that I tend to feel like I should be out training or running at almost every opportunity. Reality and physical limitations intervene, but the hot weather always makes me put in that extra 10% to get out there in the first place, and when I’m training. Most who know me have been bored by my almost evangelical approach to British Military Fitness. Anyone who has ever tried a class will not be surprised to learn that the instructors don’t take it easy in the hot weather. Tonight’s BMF session at Stamford Park was epic. Split between the two instructors, the first half involved medicine balls, weight bars and a whole lot of high intensity exercises. A swift water break provided no respite from the second half of the session – multiple body weight exercises with daysacks weighted up to 15kg, interrupted by sprints. I’m sure I’m not alone in having sweated possibly more than I ever have before. Preparing for my first race outing of 2013, it feels like such a long time since the last time I pinned a number to my shirt for the Oldham Half Marathon back in October. While I’m still formulating my full race plans for this year, last Sunday’s Lactic Flashback off-roader across the hills and moors has been planned since early in January. Organised by Kiwi Classic Events, Lactic Flashback is a resurrection of what used to be the Lactic Acid Test, providing 8 miles of muddy, hilly trails on the moors above Millbrook in Stalybridge, Tameside. Following on from the hugely enjoyable Dovestone Diamond in May last year, I was prepared for Jason’s relaxed but meticulous organisation. Registration went smoothly, and I was soon strolling the 200m to the start line. One of the things about running in smaller events is that most of the other runners look a whole lot more professional than me – never something to give a huge confidence boost at the start line! Larger races become events of their own, with charity competitors and fun runners usually outnumbering the more serious racers. The smaller the race field, the more serious it seems to become, and the more that novice racers like myself fear being left in a cloud of dust at the start. The perceived stern faces of the hardy souls on this early March morning soon cracked into smiles and laughs as usual slightly nervous banter took over the start of the race. Another all-too-short downhill section led to the halfway drinks station at the next reservoir crossing, before the final major climb on the course. Having survived the middle climb, and with the knowledge that this was the last one of the day, I had a welcome return of energy and determination to send me upwards. Travelling across varied terrain, and punctuated by numerous stiles, I found this climb easier and somehow more rewarding than the previous one. After a couple of disappointing moments when I thought I had reached the top only to be greeted by another section of climb, I emerged onto the small plateau to see the trig point at Wild Bank marking the highest point for the day! 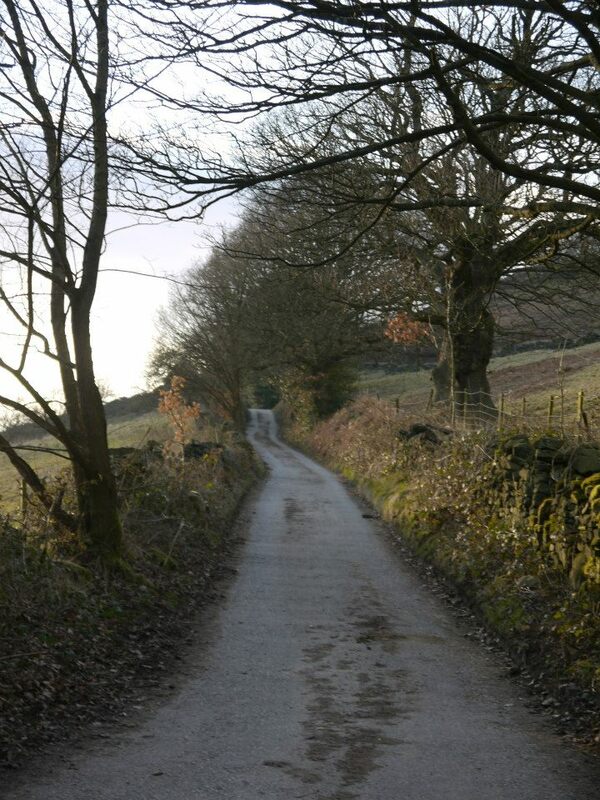 In some ways it was a shame not to have the chance to linger and marvel at the 360-degree views taking in the Manchester suburbs and the Peak District at the same time, but as a weary runner, the prospect of a downhill run all the way to the line was hugely enticing. Jason had picked out the major descent of the course in his pre-race brief, describing it as ‘Triple-X’, but nothing I imagined came close to the reality. The narrow peat track through the heather which disappeared over the precipice of Wild Bank was one of those paths that you tend to step down sideways when out on a hike, so running down it takes a further step in courage/lunacy. The basic figures speak for themselves – a drop of 525 feet in less than half a mile. Running downhill is something I need to learn how to do properly, given that on this section I was passed by two other runners who disappeared rapidly into the distance. Although it sounds strange to think that I need to learn to run with gravity, the speed and confidence with which proper trail runners can tackle downhill sections must make a huge difference to their finishing times, given that two runners who were behind me were out of sight at the finish less than a mile down the road. Safely arriving at the bottom of the steepest part of the slope, the remainder of the course was a section picking a path along a rocky route between fields, before a joyous sprint downhill back through the wide and smooth pathways of the park. Crossing the line back into the finish area (with big cheers, thanks Christina and family! ), the usual sight of doubled-over runners was joined by that of injuries being patched up by the attendant St. John’s Ambulance crew. Most of the bumps and scrapes seemed to have been collected on the triple-x descent, and nothing seemed more serious than a drop of blood – perfect post-race war wounds to show family and friends. A finish time of 1:23:54 and 69th out of 109 finishers was good enough for me on a course I hadn’t run before and with not the best week of preparation ahead of the race (missing one training session and a pint of blood!). Massive thanks to Jason and his team for organising such a good event – if any other proof is needed of their superb organisation, the chip butty included in the entry fee was a masterstroke! I’ll be ready for the Dovestone Diamond in May. One of the most astonishing things about Remembrance Sunday services held across the country is how massed groups of people manage to fall into complete silence for two minutes, often with nothing but a rustle of clothing audible. 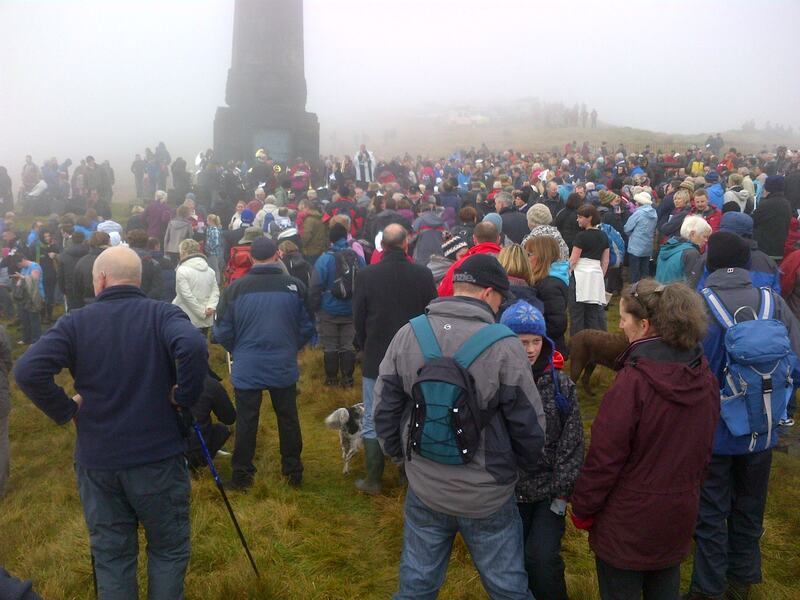 As we found at the weekend, the effect of this silence is multiplied when it occurs among hundreds of people at the top of a Saddleworth peak, huddled against the elements at the most unique 11th November I have ever experienced. A couple of hours previously we had parked up at the start of our route up the hill near the Cross Keys Inn on Running Hill in Uppermill – our first challenge being to extract an over-excited Tara from the back of the car before she managed to truss herself completely in an impenetrable mass of lead and seatbelt. With Tara ready to move and pawing the ground like a Spanish bull as if we were taking an age to get ready, we quickly picked up rucksacks, hats, gloves and poppies and set off in the morning mist. Although we were in plenty of time, we were surprised at the seeming lack of other walkers – experience from last year told us that this was a busy day, but the ease with which we found space to park on the road near the Cross Keys was surprising. Taking Gellfield Lane, we soon saw the numbers of people around us grow as families and groups of other walkers materialised from side roads and parked cars and headed on the short pilgrimage to the now mist-shrouded hill. Unlike the Summer Solstice walk to Pots and Pans, we took the steepest and most direct route up the hill, which has the advantage of lacking stiles over which Tara needed to be coaxed or hefted. As soon as we left the road and started up the familiar track towards the summit, we found we were part of a constant stream of people all heading in the same direction. This climb to the top of Alderman Hill and Pots and Pans is one we know well, and one that seems to be Tara’s favourite walk in the world. Under normal conditions and off her lead, she usually bounds up the steep slope well ahead of us – stopping only to check we’re still making progress behind her and waiting like an impatient teenager. Not this time though. The volume of other people and dogs on their way up the hill meant that Tara’s off-lead bumbling was kept to a minimum, which she luckily didn’t seem to mind too much. Arriving at the summit, we found ourselves a vantage point for the service and surveyed the crowd. As with any of these events, we encountered a number of familiar faces, nodding acquaintances and individuals recognised from any number of different Saddleworth locations, and then a hush fell over the gathering for the service of remembrance. To say this event is special sounds inadequate. Like millions of others we were gathered around a local memorial to the fallen, unlike most others, the vicar, speakers and brass band in attendance had all arrived in walking boots and slightly muddied. Under increasingly foggy conditions, the service, hymns and silence all passed off impeccably, with the laying of the wreaths from so many local organisations particularly impressive. Equally impressive to us was the sheer number of people who had made this effort to attend. Local reports in the days after the service put the attendance at up to 1,000. In an age of cynicism and a conviction that ‘things aren’t what they used to be’, it was refreshing to see the community come together. On top of this, what impressed us most was the different generations involved. Stood within a few yards of us were elderly couples, families with children, and teenagers who had arrived independently – another example of how community spirit isn’t dead and buried. At the end of the service we all started the journey back down the hill, and it became like the ascent in reverse. Gradually less and less people were around us, which meant we were even able to find a table next to an open fire in the Cross Keys. This proved to be just the tonic for a tired Tara, and the perfect spot from which to enjoy fuss and the odd sneaked taste of meat pie. No one Remembrance Sunday service can ever be compared to another – the event itself is of almost no consequence, the simple act of remembering is all that is required. However, for a truly unique experience and a renewal of faith in community spirit, this has now become something we will want to do every year. It was in July this year that we finally made our way across the border for a long-anticipated walk on the North York Moors. As the first ‘international’ walk on the blog, it would be appropriate to add a little context – Christina and I have made a habit of visiting York on fairly regular occasions to spend some time with a longstanding friend of Christina’s, Dave. Through the odd afternoon in some form of hostelry, a plan was hatched that on our next visit we would make the walk to the pub slightly longer and more scenic, taking in one of Dave’s preferred routes. 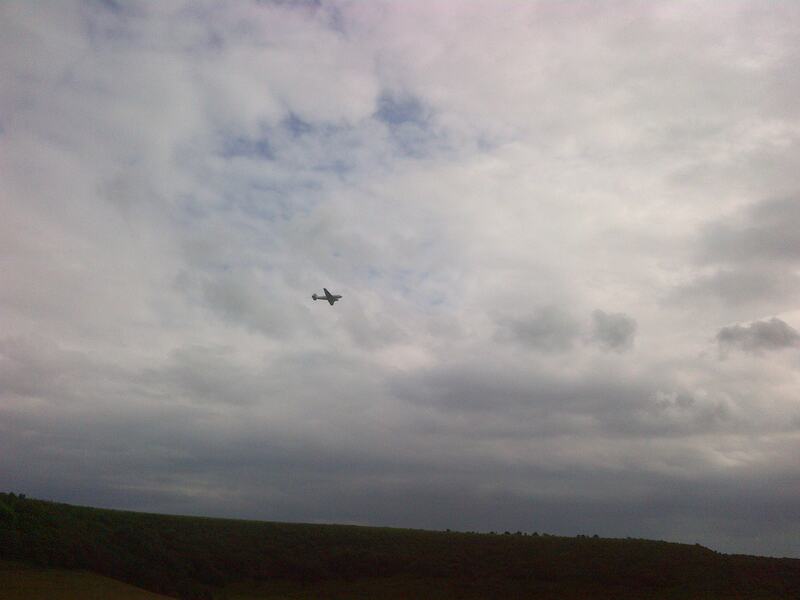 The route Dave chose for us was around the Hole of Horcum, starting from the main car park on the A169. Starting off on the edges of the moorland, the route skirts the top edge of the Hole of Horcum itself – said by legend to have been created when a giant called Wade scooped a ball of earth from the landscape and threw it at his wife forming the nearby hill of Blakey Topping. As we set off on the path across the moors, we experienced that joyful thing that most walkers yearn for as we left behind the noise of the road and headed out into the natural sounds of the moorland. Greeted instead with the sounds and sights of wildlife around us and some spectacular views across the moors landscape, starting the walk felt like a release after so many weeks trapped indoors by the ‘summer’ we have been having this year. Being able to stretch the legs and get back into a proper walking rhythm was a real treat. Continuing along the main path, we eschewed the idea of cutting across the walk early and into the Hole of Horcum, instead opting for the slightly longer route down through Levisham village. It was at this point we had our first encounter of the day with what we took to be a geophysics survey plane. Flying at low level, what looked like an old DC-3 made passes across us all day long, tracing parallel lines set distances apart. Descending a short slope into Levisham brought us to one of those sights that only the English countryside can produce – a picture-perfect village with all anyone could ever need one short street. The focus of the village is based around the church and the pub, with a scattering of outdoor seating on the village green and cottages ranging from the ‘bijou’ to the grand, radiating out. The only way I can think of to describe Levisham is that you could easily see it as the set for a film located in a typical English village. Bearing in mind it was rapidly approaching lunchtime, it didn’t take long for us to decide on stopping on the benches of the Horseshoe Inn for sustenance. The picture-perfect impression of the village and the pub were more than backed up by our eating and drinking experiences – hearty portions and locally sourced produce made the sandwiches extra tasty, washed down by fresh and unusual local beers. If you ever find yourself in the area, a stop at the Horseshoe comes very highly recommended! Suitably refreshed and refueled, we set off on the second half of the walk. Passing through the village, our route then diverted from the road and onto overgrown single tracks traversing the beginnings of the Hole of Horcum. Dave’s innate cheerfulness barely wavered as we headed deeper into the jungle-like path, perfectly confident we would soon reach the open ground of the bottom of the valley. I think it was somewhat further along than the path than he remembered, but we emerged into a beautiful riverscape as we headed along the bottom of this huge natural bowl. The river within the bowl never appears to be large or forceful enough to have created such a feature in the landscape, and it must be admitted there is something of a strange, almost silent atmosphere as you wander past an abandoned farmstead and begin to contemplate the climb ahead to regain the rim of the bowl. It is a sharp shock to the system on what is a fairly gentle walk in terms of gradient, but made all the easier by the views afforded on the climb and the pleasant heather surrounding the path. Like all of the best walks, having got back to the car we stopped off for refreshment at the sister pub of the Horseshoe Inn, the Fox and Rabbit. Like all of the best walks, we were left tired and exhilarated for the journey home – a day to remind us why we go out walking in the first place: good company, beautiful countryside and a couple of unexpected discoveries along the way.